Shortsighted planning brought an end to America's great railway stations, robbing the country of great architecture and contributing to highway overcrowding. The Infrastructurist recently chronicled the most beautiful victims. —Ed. 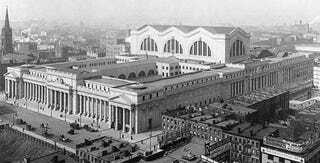 In 1963, America learned a painful lesson when Pennsylvania Station, an architectural treasure that Senator Daniel Moynihan described as "the best thing in our city," was torn down and replaced with a dreary complex that includes an office building and Madison Square Garden. The rail station, to this day the nation's busiest, was moved underground into a claustrophobic warren of artificially lit passageways and bleak waiting rooms. While there has been an active campaign since the 1990's to rectify the mistake by creating a new and worthy station a block away, the $1 billion-plus project remains stuck in political gridlock. But the sad saga of Penn was by no means an isolated incident. Almost like a rite of passage, cities across the country embraced the era of Interstates, Big Macs, and suburban sprawl by tearing down their train depots. (Frequently, they just did the Joni Mitchell thing and put up a parking lot.) But time and experience are showing that train stations are vital organs in a healthy city. The lesson is especially relevant of late as cities around the country face the challenge of rebuilding infrastructure for regional high-speed rail. Chicago — once blessed with an abundance of grand stations -– is today kicking around ideas for a new high-speed rail depot. What follows is a tour of 10 great depots that were lost to demolition orders -– plus one more that might meet the bulldozer -– and what stands on those sites today. When Memphis's Union Station opened in 1912, it was the largest stone structure in town. But when the U.S. Postal Service announced that it needed city land in the late 1960s, the magnificent building was chosen for demolition because it no longer attracted crowds. Any interest in saving the structure itself was ignored. These days Memphis is expressing interest in being part of the Southeast High Speed Rail Corridor. Atlanta was once the largest rail crossroads in the South. Built in 1905, Terminal was the stately portal to the region's grandest city. It had two Italianate towers and a huge train shed in the rear. When the station was razed in 1970, it was replaced by a government office building. These days, Atlanta's intercity rail depot is a former commuter rail station located far north of downtown and adjacent to a sixteen-lane highway. Georgia governor Sonny Perduerecently endorsed the idea of a high speed rail network for southeastern America.. Naturally, Atlanta would be a hub for that network, and in need of a suitable depot. In 1909, Birmingham opened its grand Terminal Station, which united the train services of six operators. The two block-long Byzantine-styled complex had 10 tracks, and when opened was the largest of its kind in the South. Yet this station — which served a peak of 54 trains a day in 1943 — was only seeing seven daily arrivals by 1969. As a result, the city chose to demolish the structure that year. Although the land was originally intended for a new federal building, a highway was built there instead. Today, Birmingham is slated as a primary stop on the proposed high-speed rail corridor linking New Orleans and Atlanta. More than any other American city, Chicago owes its existence to its transportation links to the rest of the country. As such, it once had an abundance of train stations. And while there are still four commuter terminals inside the Loop, knocking down impressive stations like Grand Central did not yield much in the way of benefits. The site of this former station, prime real estate on the banks of the Illinois River, is still a vacant lot after nearly four decades. This 13-story Romanesque structure was built in 1893 and demolished eight decades later. As with Grand Central, the site remains undeveloped to this day. Rochester's principal train station opened in 1914 with New York Central Railroad connections to New York, Albany, and Buffalo. The elaborate curved-brick exterior made a prominent mark on downtown, but a decline in passenger traffic emptied the station by the late 1950s, and the building was razed in 1965. In its place? A parking lot. After being built in 1930, the smaller of Atlanta's train depots was demolished in 1972. Boston completed its Union Station in 1895, only to tear it down thirty years later to build the Boston Garden basketball arena. Which is to say, the city lost a beautiful neoclassical structure for its train services, replacing it instead with a basement of a stadium. When the Garden itself was demolished for a new arena in 1995 — the mellifluously named TD BankNorth Garden — North Station was renewed as an underground facility. While it's easy to pick on the new Garden's bland design, the new building is at least a vital and economically productive part of the city's fabric. The fact that North Station fell so long ago might have something to do with this. NOW: The new Garden and an underground rail station. Completed in 1902, Savannah's Spanish Renaissance Union Station stood on the west end of downtown. For city-dwelling blacks, Union Station was the center of life. All that changed in 1963, however, when the depot and much of the neighborhood around it was bulldozed to make way for the tail end of an Interstate. If Gov. Sonny Perdue gets his way, Savannah will someday reclaim its rail heritage and become a stop on an HSR link between Atlanta and Jacksonville. Unlike the other stations on this list, Michigan Central is still standing. But if the Detroit city council gets its way, the station, which was the 1912 encore by the same team of architects that designed NYC's Grand Central (itself almost a victim of the wrecking ball until the US Supreme Court intervened in 1978), will be demolished. Ironically, the city council wants to use funds from the stimulus act — the same piece of legislation that provided $8 billion to begin building a high speed rail network — to do the dirty work on Michigan Central. Though it has suffered two decades of vandalism and disuse, the depot remains worth saving. With a bit of imagination, it could be part of Detroit's future as a hub on the Midwest regional HSR network. THEN AND NOW: The building was the second act of the architects who designed NYC's Grand Central Terminal. But will it be demolished? Jebediah Reed is an editor-at-large for The Infrastructurist, a website exploring the built environment and its impact on society. Yonah Freemark is an independent researcher currently working in France.